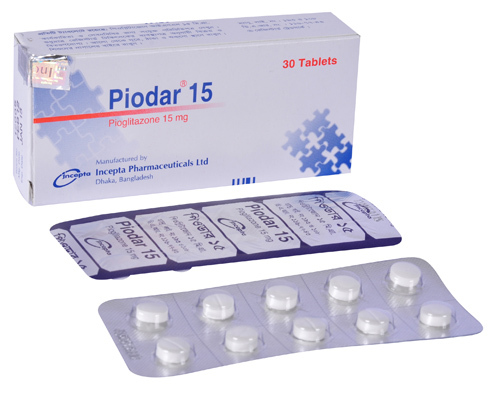 Piodar 15 : Each tablet contains Pioglitazone Hydrochloride INN equivalent to Pioglitazone 15 mg.
Piodar is a member of the newest class of oral antidiabetic agents called thiazolidinediones which depend on the presence of insulin for its mechanism of action. Piodar decreases insulin resistance in the periphery and in the liver resulting in increased insulin-dependent glucose disposal and decreased hepatic glucose output. It also improves abnormality in lipid metabolism by activating PPAR-γ receptor. Piodar is indicated as an adjunct to diet and exercise to improve glycemic control in patients with type II diabetes (NIDDM). 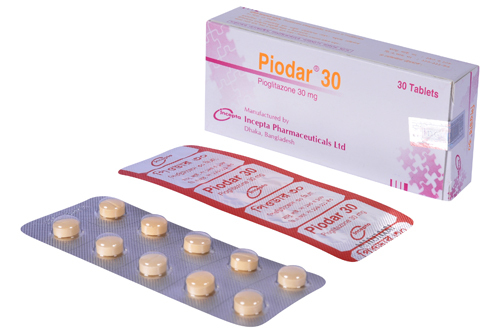 Piodar is indicated for monotherapy and also indicated for use in combination with a sulfonylurea, metformin or insulin when diet and exercise plus the single agent does not result in adequate glycemic control. Piodar can be taken once daily without regard to meals. The management of antidiabetic therapy should be individualized. Piodar monotherapy in patients not adequately controlled with diet and exercise may be initiated at 15 mg or 30 mg once daily. For patients who respond inadequately to the initial dose of Piodar, the dose can be increased up to 45 mg once daily. For patients not responding adequately to monotherapy, combination therapy should be considered. Upper respiratory tract infections13.2%, headache 9.1%, sinusitis 6.3%,myalgia 5.4%, tooth disorder 5.3%, pharyngitis 5.1%. Pioglitazone exerts its hypoglycemic effect only in the presence of insulin. Therefore it should not be used in patients with type I diabetes or for the treatment of diabetic ketoacidosis. Pioglitazone should be used with caution in case of combination therapy, hepatic insufficiency and heart diseases. Pregnancy: There are no adequate and well controlled studies in pregnant women. Pioglitazone should be used during pregnancy only if the potential benefit justifies the potential risk to the fetus. Nursing Mothers: It is not known whether pioglitazone is secreted in human milk. Because many drugs are excreted in human milk, it should not be administered to a breast feeding women.